Nope, it wasn't ignoring it. Nyko's firmware is a mess. Really bad idea when they decided to send two signals from a single axis. Later versions of the firmware seem to have corrected the issue, but most people still have the buggy firmware. We added a hack just for the Nyko series, but I see that it's not always detecting properly if you have the old firmware. 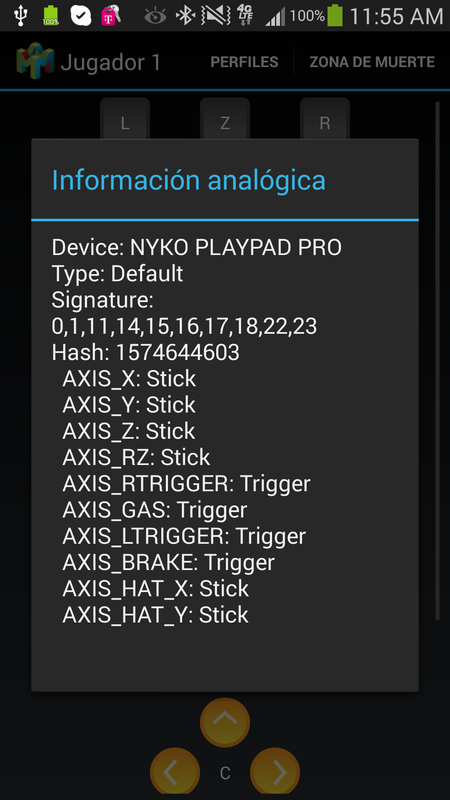 (If you did, the screenshot would show 'Type: Nyko PlayPad series (original firmware)'. Out of curiosity, how long ago did you buy the controller? Yes, the firmware updater is HORRIBLE. It broke all bluetooth functionality on my Nexus 7. Took me a lot of googling for the fix. I don't think too highly of Nyko at this point... wasting our time adding really bad hacks for their poor design. Let me know if you really desperately need a fix for this, or if you can get by with loading the defaults as you've said. Setting the defaults works fine, the only keys that would need remapping at the R, Z, and L triggers depending on how you like them, and those have no issues. I would recommend putting a warning sign in the device compatibility master list regarding the nyko suggesting not to remap the analog stick and just leave it by default. Done. Thanks for the help and patience. I need help connecting the nyko playpad in general first. Got it for christmas and it shows both hid and app on and at the place where it shows icade, 1, 2 and mouse it shows icade is on even though it isn't connected to anything. If anyone knows how to solve this please reply asap! Its like this I dont even know how it happend it shows both app and hid being on. Plus it wont even connect to the phone. How do i connect it to the phone now? Looks like a Nyko issue. Have you tried contacting them? and when i press and hold d pad left it shows only app lighting up and when i press and hold d pad right it shows hid lighting up. WTF. Do you think we are Nyko customer support? If you got a gift receipt with it, maybe you can exchange it. Personally I would wait to talk with their tech support first, though.